Protect your Android phone and tablet with our cutting edge mobile security app. 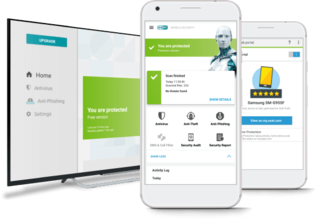 Our security app for Android offers the full suite of protection for your device – antivirus, anti-phishing, real-time scanning, remote lock. Get your free download now. Do I need antivirus for my Android device? If you want peace of mind that your Android phone or tablet is safe and secure, get mobile security. As Android phones continue to grow in popularity, they’re increasing the target for criminals and hackers. New viruses and ways to exploit Android devices are becoming more common. A mobile security app can keep you ahead of the threats.